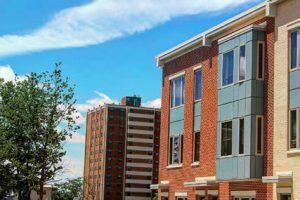 The mission of the Brewerytown Sharswood Community Civic Association (BSCCA) as a Registered Community Organization (RCO) is to reinforce and strengthen the positive characteristics of the built environment in the BSCCA area. BSCCA’s Zoning Subommittee meets to review projects that are subject to RCO review within the BSCCA boundary area. We then provide a monthly public forum for neighbors and applicants seeking variances to the zoning code to discuss proposed construction projects and consider the impacts of the projects on their surroundings. BSCCA Community Meetings are held on the third Thursday of each month. Meetings begin at 6:30pm and will end by 8:30pm. Meetings will be extended past 8:30pm only by motion. From September to June, meetings are held at Camelot Academy located at 1435 N. 26th Street, Philadelphia PA 19121. In July and August meetings are held at the offices of the BrewerytownSharswood Neighborhood Advisory Council (BSNAC) located at 30th and Master Streets. The Zoning Committee meets every second Tuesday of each month to review the applications before community meetings. Applicants are required to notify BSCCA Zoning Subcommittee by email regarding a variance and/or special exception request within seven (7) days of: (a) filing an appeal to the Zoning Board of Adjustment for approval of a special exception or variance; or (b) being notified by L&I that an application will require review under the Civic Design Review Process. BSCCA Zoning will only consider requests received by the first Monday of each month. Any requests received after 5pm on the first Monday of any particular month will be considered for the following month. After reviewing applicant requests, the BSCCA Zoning Subcommittee will schedule an appearance during the zoning presentations at the BSCCA monthly community meetings. The BSCCA monthly community meetings allow residents of the Brewerytown-Sharswood area to provide direct neighborhood input into this important civic decision-making process. Applicants are required to provide physical copies and/or a PDF file of the Zoning Refusal and/or Referral received from L&I and/or plans, zoning submission drawings, and Petition to Appeal to the BSCCA no later than 5pm on the first Friday of the month prior to the BSCCA Zoning Subcommittee meeting on the second Tuesday of each month for consideration by the zoning subcommittee. Applicants will not be placed on the meeting agenda if this requirement is not met. Applicants shall bring a minimum of six (6) copies of the presentation materials in 11×17 format to their presentation at the BSCCA community meeting. It is strongly suggested that applicants bring an additional 25-30 copies of the documents to pass out to attendees – copies may be in standard 8.5 x11 format. An applicant may supplement these materials at the meeting. The applicant is required to distribute leaflets notifying neighbors of the proposed zoning project in accordance with the Planning Commission’s requirements. The Zoning Committee Chair will introduce each applicant, read aloud the refusal explaining the variances and/or special exceptions sought, and ask the applicant to present their proposal to the community. A minimum of one property owner must represent the applicant property at the Zoning Committee Meeting. The applicant is strongly encouraged to have his/her architect and/or attorney present. Each applicant will have a maximum of 15 minutes to present their proposal. After the applicant has completed their presentation to the community, the Committee Members shall have first opportunity to ask questions and or comment on the project presented. When the Zoning Committee has no further questions, questions and comments from community members will be encouraged and will be moderated by the Zoning Committee Chair. Questions and comments should be limited to two minutes per community member and the floor should be relinquished after the initial questions or comments are presented. If a question or comment has not been addressed to the satisfaction of a community member, he or she should request the opportunity to speak again and not engage in dialogue with the applicant. Interaction between community members and applicants is expected to be conducted in an orderly manner at all times and not to become argumentative. The Zoning Committee reserves the right to ask persons to leave the meeting if he/she is unable to adhere to these procedures. At the conclusion of each presentation and discussion, the applicants and any interested parties associated with the proposed project will be asked to depart the room and the Zoning Committee and community members will vote on their positions regarding the application. After the meeting, the BSCCA Zoning Committee will send a letter to the ZBA and/or the Civic Design Review Chair and other parties as deemed appropriate with a copy to the applicant that outlines the position of the Zoning Committee and a summary of the Zoning Committee’s meeting. The recommendation of the Zoning Committee is not the final outcome. ZBA makes the final decision with respect to all variances and special exceptions appeals. Members of the Zoning Committee, or counsel to the committee, may appear at ZBA hearings to reinforce BSCCA’s position on applications. In addition, any citizen who would be impacted by the proposed variance has the right to appear at the ZBA hearing to speak for or against an application. Download this page BSCCA Community Zoning Protocols. Download Zoning Tips for Community Organizations.